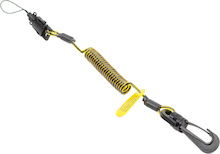 The 3M� DBI-SALA� Clip2Loop Coil Tether is engineered to withstand harsh work environments. The ballistic nylon heavy-duty swivel snap quickly attaches to any D-ring attachment, while a side release loop attachment provides a quick and secure solution to tethering cameras, cell phones, radios, and other small objects. This coil combines perfectly with our Micro D-ring to create drop prevention solutions for items that otherwise are very difficult to tether.. Compact and lightweight, this style provides a quick and secure solution for tethering cameras, cell phones, radios, and other small objects. Coils down to 7 in. (17.8 cm) and stretches out to 34 in. (86.4 cm) to stay out of the workers way.